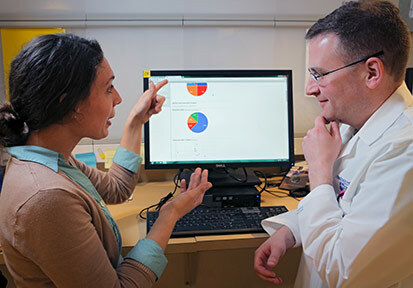 Although the OPOR currently manages more than fifty clinical research projects in neurology and neurosurgery, including NIH-funded multicenter studies, the largest clinical areas of growth are stroke, cerebrovascular disease, and neuro-oncology. One study for which the office is currently writing a protocol is an investigator-initiated trial in patients with neoblastomas. Penn State Hershey will be the primary site, and will investigate the optimal method of tailoring each patient’s treatment based on biomarkers specific to the particular tumor the patient has. The goal of this research is truly individualized treatment. Graybeal foresees explosive growth over the next year in Penn State Hershey’s ability to gather data from its electronic medical records. Scientists can then use this vast repository of data for their own studies, as well as when identifying the best course of treatment for patients with a specific disease. Once HIPAA concerns are addressed, Graybeal contends that the OPOR’s ability to evaluate “big data” will represent a significant breakthrough in the field of translational research – a breakthrough for which his office is ideally positioned.